Using to do lists is a very important part of getting organized and getting things done in your life. They can be simple or complex, depending on your needs and what actually works for you to be more productive. All the lists in the world won’t actually get your work done, you still have to do that part. A To do list is basically a list of tasks, or things that need to be done in order to reach a goal or complete a project. They can be used for anything, for something as small as a grocery list to something as large as planning a major project like building a new home or planning a wedding! The traditional way to make lists is to use a pen and paper. That’s still my preferred method. It’s quick and easy. For bigger lists you can employ your computer or PDA. There is plenty of software out there to help with lists and time management. They help you plan things out that need to be done. You can see the scope of the chores and projects out in front of you allowing you to plan accordingly. They help to keep you on track. Stick to your list instead of getting side tracked to other projects or activities. They take the place of relying on your memory. And if your memory is like mine, it’s not foolproof and things get forgotten. So write them down! They give you satisfaction. As you complete items on your list, you can look back and see just how much work you have accomplished. This is a great feeling. It helps to make tangible all those things that would otherwise just have gotten done without anyone necessarily noticing, including yourself. Sometimes you just need to know you made a difference even if it was doing simple daily tasks like laundry, and making the beds. Some lists need little to no prioritization. They’re short and simple. But many do. Even my grocery list is organized by the aisles of the grocery store to be more efficient. 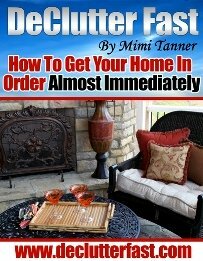 For large projects that have many things to be done you may want to outline your list a little differently. Let’s use the example of building a new home. This is a very basic glimpse into what would be a very large list. You can put the items in order of most important to least important, or what needs to be done first to what can be done last. As well, under each of the above items, there would most likely be more detailed things to do in order to accomplish those tasks. Another way to prioritize this sort of to do list is to use the ABC method in which you put an “A” by what is most important, “B” by what is next most important, and a “C” by what is least important. Some people prioritize using the ABC method with “A” meaning it needs to be done within a day, “B” done within a week and “C” done within a month. When prioritizing your daily to do list, you may want to use numbers to help prioritize what is most important to least important or you can simply put them in order from most important to least important. All of these prioritization methods can be great, but they can also be time wasters. You could potentially spend more time making lists than actually doing the tasks on them, causing you to be no more productive than before. So be careful with that. Do only what you need to do to keep yourself organized. Now that I’ve talked to you about various ways to organize and prioritize To Do Lists, let me tell you exactly how I manage my lists. I don’t use the above methods, exactly. I’ve tweaked to find what works best for me. I keep two major lists along with a weekly list and a daily list in conjunction with my family wall calendar. I keep a Home Projects List. This is a never ending list as any home owner knows! It’s a list of small and large projects that need to be done around the house. It also includes big dream items that we would love to get around to “someday” when we have more time and money. When I’m planning our weekend, we can pull one of these projects off the list to tackle. Important to remember is that some of these items can be large so we need to break it down into smaller tasks which can actually be accomplished in a few hours or a day. 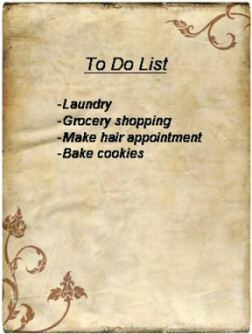 I also keep a General To Do List of things that need to get done. This includes things that may or may not have a time constraint but I don’t want to forget anything, so I write them down. If there IS a due date, I put that next to the item on the list. I have a Weekly List of sorts. 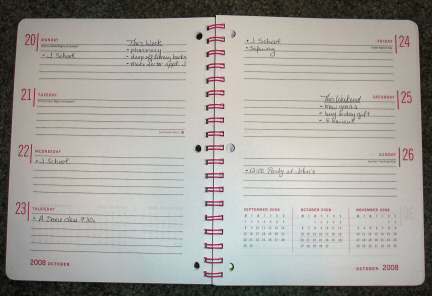 I have a very basic spiral bound weekly planner (see photo below). When it’s opened, you can see the seven days of the week and each day has blank lines to write on. Off to the side by Monday I write “This Week” and under it I write down things that need to be done this week. On each specific day of the week I make my Daily List. I write what needs to be done on that day. I take anything from the wall calendar that’s important and add any other items I may have (ex. make doctor appointment, etc.). I also make a Weekend List. Off to the side by Saturday and Sunday, I write “This Weekend” and make a list of anything I want to accomplish for that weekend. Perhaps one of those home project items or a quick trip to the store, etc. This method works for me because I can see my daily, weekly and weekend lists all in one place. On some pages in the back of this planner are my house projects and general to do lists. So everything is in one place for me. One big challenge I work with regularly is trying not to plan more than is physically possible to accomplish. It’s really hard to not want to write down everything you would love to have done in a day, week or weekend. But if your week goes by and you only managed to accomplish half of your list, you’re going to feel defeated. So do your best to only write down what is realistic, leaving time for every day things and family time. Hopefully the above information helps guide you to finding a list making method that works best for you. Remember, the goal is to be more productive and stay on task. Not to have the best looking list! You may also be interested in our To Do Lists Library where you can download planning checklists for various things such as grocery shopping, vacation planning and party planning.